In Grade 11, the counselors again play a pivotal role in recommending subject choices based on the records of the past 3 years of the child (Grade 8, 9, 10). Counsellors arrange for guest lectures in various fields of careers, arrange for interaction with representatives of Foreign universities, Indian institutions of acclaim to make the students aware of the array of options available for them. 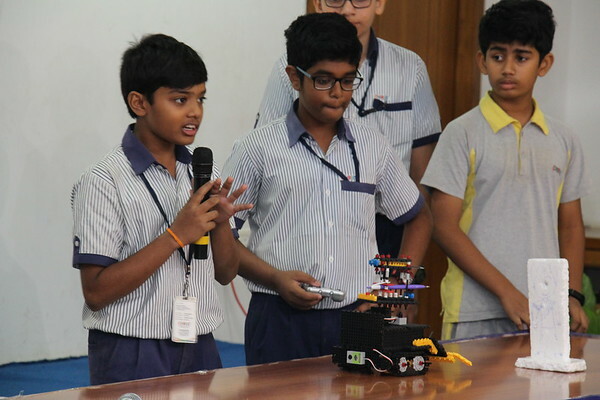 Students of Classes 6, 7 & 8 participated in the Robotics Rubric Competition on 16th Feb ’18. 4 - 5 teams from each class presented a 5-min demonstration of their robots, and described its functionality and potential future use. The criterion for judgement included Design, Team Work, Use of Sensors in Programming, Structural Components, Material, Journal Notes and Overall Functionality. Bhopal Reddy, Embedded Technology Expert from Next Page Technology and Prashanth K., IT Head from MS Academy were the judges for the competition. The models will be displayed for the parents on 17th Feb 2018 and 1 winner from each class will be chosen. Students from CHIREC International School’s Physics and Engineering Club successfully launched an Octocopter (multirotor with eight rotors) capable of lifting a human pilot, weighing around 70 kg, on Wednesday, 2nd August 2017 at CHIREC Kondapur Campus. 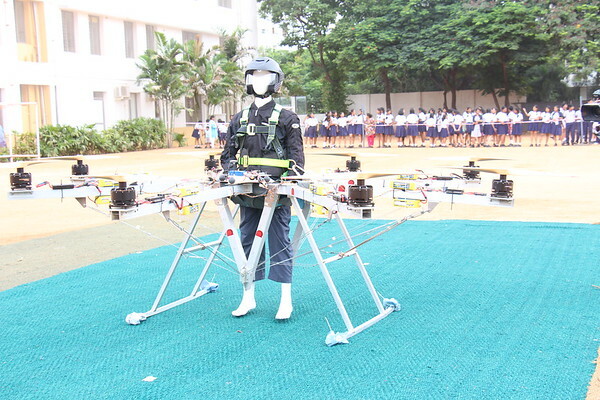 The team of 4 students, Vinay Kanumuri, Vineet Alaparthi, Amog Iska and Aaditya Maddukuri and two CHIREC Alumni, Sahevaan Taneja and Surya Taneja, undertook the project to design, build and fly the Octocopter. The project is the first of its kind by students in India. The drone was launched in the presence of Mr. Anand and Mr. Sujai of T-work, Mr. Nikhil Rangandas, CEO of Delta Tech, Captain A.S. Randhawa, Commander of 737 fleet of Jet Airways, and Wg Cdr Polu Sreedhar of the Indian Air Force. The drone will pave the way for more ambitious endeavours, decreasing costs and increasing ease of use, flight time and speed. The Club will focus on building larger scale versions of this design to support such applications.